Banbridge and Ulster Elks got their Irish Senior Cup defences off to a winning start on Saturday. In the men's competition Banbridge beat UCD 5-3 in Dublin with Neil Gilmore scoring twice while Annadale were 4-1 winners at Belfast Harlequins. Ireland trio Paul Gleghorne, Timmy Cockram and Neal Glassey were on target as Lisnagarvey overcame NICS 5-0. Elks captain Gemma Frazer was on the scoresheet in a 3-0 victory at Old Alex. 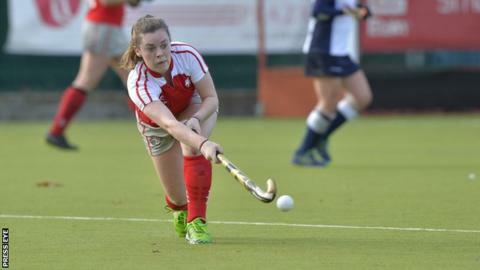 Rebecca Barry and Hannah Irwin were the other scorers for the current EYHL leaders. Suzanne Ferris scored five times and Vanessa Surgenor helped herself to a hat-trick as Pegasus beat North Down 13-0 but despite her exploits. However, Ferris wasn't the top scorer of the day as international Anna O'Flanagan helped herself to six as Hermes defeated Greenfields 12-0. In two other Ulster derbies Dungannon came from 2-0 down at Lisnagarvey to eventually win 5-4 on penalties while Randalstown squeezed past Armagh 1-0, and a treble from Nikki Parke helped Ballymoney into the next round with a 7-2 home win over Cork C of I.
Queens University were blanked 5-0 at UCD while Belfast Harlequins lost 5-3 at UCC. Kilkeel were the top scorers of the round as they hammered Cork Harlequins 14-1 in the men's competition while Irish champions Monkstown notched 13 in their win at Weston. Other Ulster winners were Instonians, who overcame Avoca 9-1 and Mossley, who edged Rathgar 2-1.